Making of a good museum specimen involves meticulous planning at the time of biopsy, grossing and careful handling thereafter. Oral lesions vary widely in their gross presentations, color, texture, pattern of growth and are relatively smaller and more fragile. Crafting a museum specimen requires a more skilled workmanship and flexible material to work with. We describe here the institutional experience of the use of translucent materials readily available in any histopathological laboratory combined with routine stationery in displaying a specimen to its optimal elegance. Museum specimens are generally mounted in glass jars or Perspex boxes using center plates or glass rods to which the specimen is fixed or sutured. , Use of Perspex sheets as a center plate requires the use of power tools (saw, drills, vice etc. ), which in turn require time and skill to produce good results. A more feasible alternative would be polyethylene terephthalate (PET, PETE or polyester) that is commonly used for carbonated beverage and water bottles. PET provides sufficient alcohol and essential oil barrier properties, generally good chemical resistance (although acetones and ketones will attack PET) and a high degree of impact resistance and tensile strength. These bottles are translucent, thin and inert, and can easily be cut with scissors or a blade in order to adapt properly to the size of the jar. PET sheets can be easily cut, sutured to the specimens (multiple if needed) and does not visually hinder the display [Figure 1]. 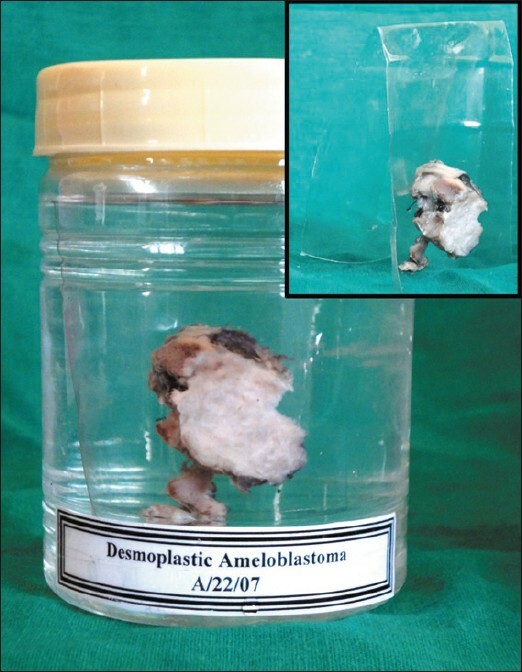 For a smaller jar, a hinge-like preparation of these plastic bottles gives a stable support to the specimen [Figure 2]. The PET sheets may be covered by a black polythene sheet to enhance the contrast of the specimen being displayed. The PET sheets used in our department for mounting specimens have not lost integrity, color or contour over a period of 12 months. 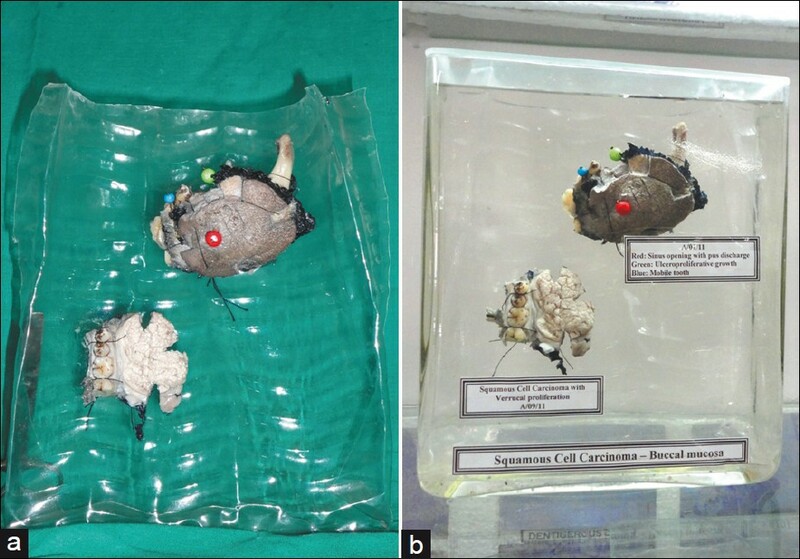 For highlighting different components of a specimen, colored gem clips, thermocol balls, beads and pins were used [Figure 3]. in a glass jar. The labeling is done on top of the jar. PET jar on a hinge shaped folding of the PET sheet (inset). 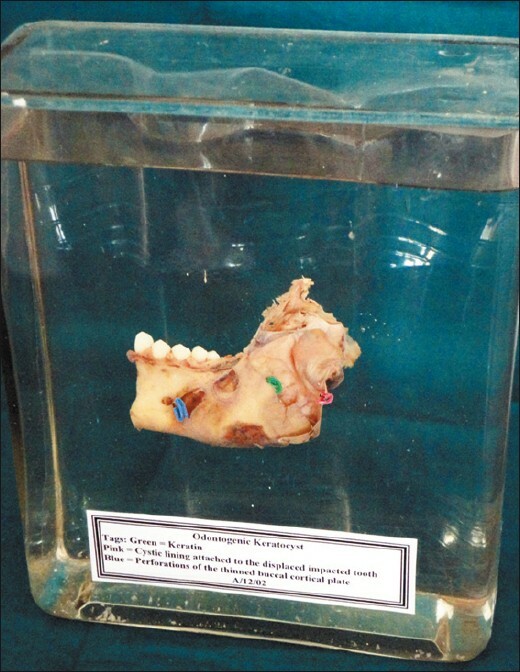 Figure 3: Mounting of a specimen of keratocystic odontogenic tumor with the effi cient use of colored paper clips to demonstrate perforations, keratin, cystic lining with attached impacted tooth. Another novel substitute for the center plate would be a combination of glass slides in desired manner. The commercially available microslides measure 75 × 25 × 1.35 mm. Slides can be joined together using DPX mountant to get required shapes and sizes suitable for the specimen to be displayed against [Figure 4]. Both glass and DPX are inert and retain their rigidity and integrity when immersed in mounting fluids. Small soft tissue specimens can be attached to the slide by a cruciform suture at an appropriate height and when placed inside a conical flask produces a mount worth displaying. Small and fragile tissues that might tear on application of suture can be simply stuck to the glass slide using acrylate glue (for quick results) or DPX. Tooth specimens can be attached in a similar manner to a slide to facilitate handling and preservation. Dry tooth specimens can be displayed and preserved well in containers of objective lenses (supplied by microscope manufacturers) with the help of steel wires and acrylic buttons. Figure 4: Note the display of a unique presentation of radicular cyst with clinical, radiographic and histopathological features. Inset: the specimen is mounted on two glass slides joined together with DPX then placed in a round fl ask. In the case of a cystic specimen, capillary tubes may be used to keep the thin cystic lining from folding in/collapsing into the lumen. 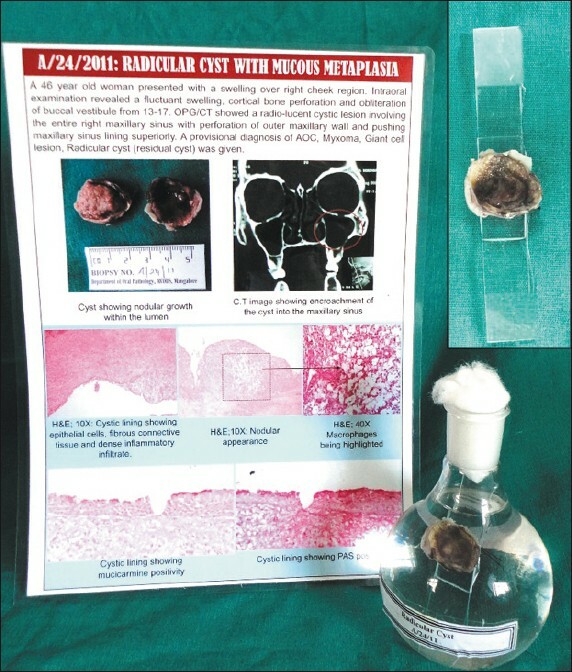 Smaller cysts (with or without cystic contents) can be filled with a clear acrylate to maintain the patency of the cystic lumen and demonstrate the cyst and its contents. To obtain the best results, specimens must be immersed in a fixative immediately. Kaiserling's technique advocates the use of a solution of formalin, water, potassium nitrate, and potassium acetate for fixation, the immersion in ethyl alcohol to restore color and preservation in a solution of glycerin, aqueous arsenious acid, water, potassium acetate and thymol. The use of 10% neutral-buffered formalin as a fixative has given us satisfactory results to preserve the specimen. Formalin fixative should be replenished to ensure that the fluid does not dry out as it may lead to deposition of paraformaldehyde crystals on the specimen. These simple techniques of mounting when supplemented by clinical, radiographic and histopathological photographs alongside make for a wonderful museum display [Figure 4]. 1. Pulvertaft RJ. Museum Techniques: A Review. J Clin Pathol 1950;3:1-23. 2. Proger LW. Perspex Jars for Pathological Museums. J Clin Pathol 1958;11:92-5. 3. Culling CF, Allison RT, Barr WT. Cellular pathology technique. S.l. London: Butterworth and Cooperations; 1985. Patil, S., Rao, R.S., Ganavi, B.S.